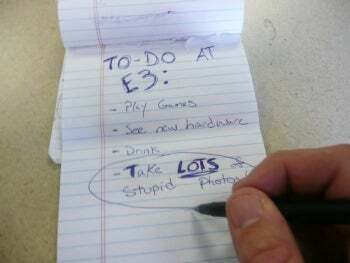 There's this little tradeshow coming up next week, the Electronic Entertainment Expo (aka E3). Maybe you've heard of it? It's where all the hot new videogames come out to play. Yatta yatta yatta. Anyhow, it's a 300-ring circus of a trade show. Since I'm going to be there waving the flag for PC World, I was hoping for a little help from you--the readers--with a little social experiment. 2. Add that scavenger hunt item to the comments field below or tweet "@" me on Twitter (gizmogladstone) so that I can see all your requests while running around the show. If this works out as planned, I'll pop up the photos for next week's Casual Friday column. But in order for it to work, I need your help! So start coming up with some ideas, people! Oh, and of course don't forget to stay plugged in to Matt Peckham's Game On blog this coming week as he covers the show from more angles than a dodecahedron.